It’s a long trip east for those who set their sights on competing indoors in the fall. Each season the riders from the left coast have a chance to shine in this competitive setting. Of course many top horses and riders share the glory, but the west coast is not second to the east and often steps into the limelight as illustrated below. On the opening Equitation Weekend presented by Bigeq.com, Morgan Geller and Fabricio topped the North American Flat Equitation Championship, were champions in the 16-year-old Equitation, and second in the North American Equitation Championship. Geller trains with Katie Gardner and Jim Hagman of Elvenstar. Conor Perrin was fourth, Alicia Gasser fifth, Olivia Esse sixth and Demi Stiegler ninth in the North American Equitation Championships. Alison Fithian and Julia Nagler both earned wins in their respective equitation divisions. Pilar Flournoy, 14, from Topanga, CA, made her first trip east a worthwhile one, as she laid down two solid rounds to win the Taylor Harris Insurance Services National Children’s Medal Finals. Flournoy, who trains with Huntover, has that keen ability to stay focused under pressure. She also won the CPHA Foundation Eq Championships earlier this year. Destry Spielberg finished fourth and Alexandra Ladove seventh. Yet another Californian to dominate the Show Place Arena was Adrienne Dixon. Dixon, of Hillsborough, California, piloted Conor Perrin’s Nat King Cole to top honors in the North American Amateur Equitation Championships. Solid in the irons for many years, Dixon now rides with Hunterbrook. Third time at Capital Challenge was a charm for Kristi Siam of Chatsworth, CA and her horse Krosus. She was third in the North American Amateur Equitation Championships. And after a three-round battle with Mahala Rummel, Siam came away with the win in the ARIAT National Adult Medal Finals. She trains with Karen Healey Stables. Heidi Kane of Newport Beach, CA, rode Sin City to the championship in the Amateur-Owner 36 & Over Hunter 3’3” division. She trains with her daughter Nicole Kane. Jenny Karazissis competed on Sin City in the $15,000 WCHR Professional Challenge earning eighth. With the hopes of just simply having a good round, Chelsea Samuels traveled from her home in La Canada, CA with trainer Archie Cox to compete in the 18-35 Adult Amateur Hunter division. She had several ‘good’ rounds on her 11-year-old Brandenburg gelding Brooklyn, taking the championship. 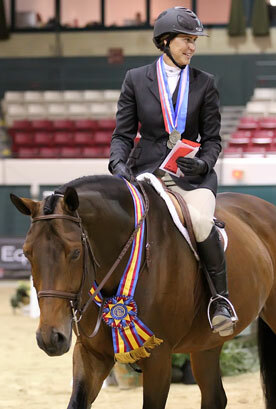 In her final junior year, Olivia Esse of Pasadena, CA, swept the championships in the Junior Hunter 16-17 divisions. Training with Makoto Farm, she rode Clooney, a seven-year-old Holsteiner gelding by Carpaccio, for Oscany Inc. to the championship in the Small Junior 16-17 Hunters. On Small Affair, owned by Iwasaki & Reilly, she was champion in the Large Junior 16-17 Hunters and earned the EMO Junior Trip of the Show. They were also named the High Point Junior Hunter 16-17 sponsored by The Clothes Horse. Canadian-born now Rancho Santa Fe, CA resident Christa Endicott rode Come Monday, an eight-year-old Holsteiner mare owned by Davlyn Farms, to the tri-color in the First Year Green Hunters Section B. The pair was also fifth in the $15,000 WCHR Professional Challenge class. 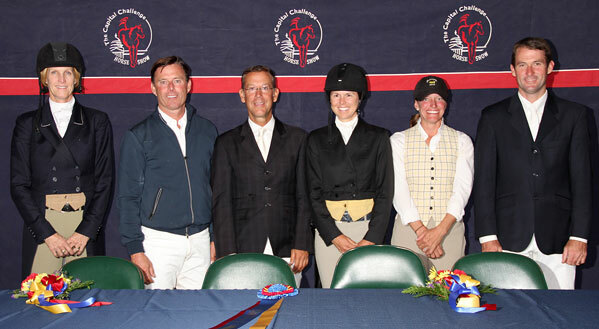 Another Canadian-born California resident Tara Metzner won the $5,000 WCHR Emerging Pro Challenge. She had the enviable task of competing on Destry Spielberg’s Rumba, the winner of the inaugural USHJA International Hunter Derby Finals. Also champion in the 3’6” Performance Hunter Division, this was Metzner’s inaugural year competing at the Capital Challenge. Actually west coast emerging pros picked up second through fourth as well as sixth in the WCHR Emerging Pro Challenge. Jamie Taylor rode Erin Bland’s Weatherly to second, Hope Glynn picked up fourth on Helen McEvoy’s Chance of Flurries and Teddi Jo Mellancamp was sixth on Woodvale Inc’s Brooklyn. No stranger to winning on either coast, John French picked up the championship in the Future Hunter 6 & over division on Gail Morey’s new hunter, Safe Haven and on Iwasaki & Reilly’s Small Celebration in the Future Hunter, Mare Division. He went on to claim the $15,000 WCHR Professional Challenge class for the second year in a row on Iwasaki & Reilly’s Small Affair. The win was bittersweet for French who choked up when he admitted that the ride might be his last on this talented hunter. Continuing his winning rides, French was the picture of consistency in the WCHR Professional Finals and again took the top prize. Jenny Karazissis was sixth in this prestigious class.